Terry Cho, Aug. 2, 2017, 9:44 a.m.
Choi Kang-jun, the 13-year-old son of PGA Tour veteran Choi Kyoung-ju, has only been playing golf for about four years. But he's already set his sights on a lofty goal: to win more PGA titles than his father, better known as K.J. Choi. "I'd like to become a PGA Tour player by age 20," said Choi, after finishing his second round at the Korea National Junior Championship at Lake Hills Yongin Country Club in Yongin, some 50 kilometers south of Seoul. "My father has won eight times on the PGA Tour, and I want to do better than that and win 10 titles." Choi, who will turn 14 in December, is the youngest of three children in the Choi family. He played baseball when he was younger and picked up golf at 10. 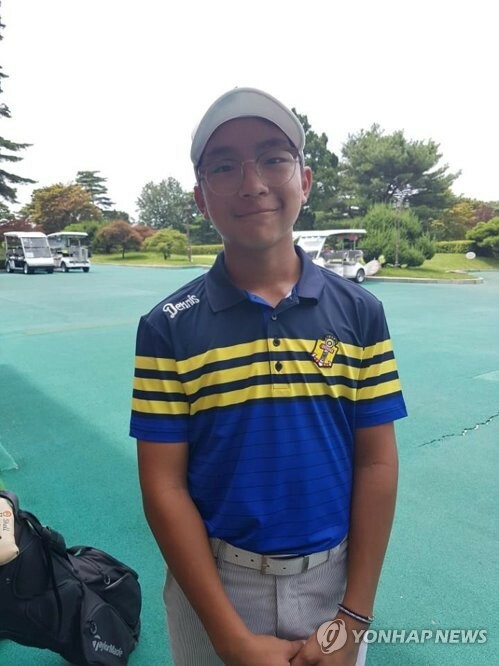 At the par-72 course here, Choi shot a 74 in Tuesday's first round, and carded a 76 on Wednesday, which put him in a tie for sixth among 21 players in the middle school division. Choi is nine shots behind the leader, Sung Joon-min. Choi, whose English name is Daniel, said Korean courses tend to have longer grass than American courses, and Lake Hills played tougher on Wednesday than the previous day because it was drier. The young Choi has already tasted several victories in his burgeoning career. In July last year, he won a sectional Junior PGA Championship title in Texas, with his father carrying the bag. Choi, who said his career low is a four-under 66, claimed he has won about 20 times so far. Aside from his father, Choi said Rory McIlroy, former world No. 1 and four-time major champion, is his favorite player. "He is not a tall player, but with that great swing of his, he can drive it a long way," Choi said. "When I grow up, I want to be able to hit it 330 yards off the tee." Choi's older brother, 20-year-old Ho-jun (David), is also in town to watch Kang-jun play. Choi Ho-jun is also a golfer, but he said he's taking some time off with a hand injury.